In spring 2016, Kelly O’Donnell remembers having a tough, potentially life-changing decision to make. As a graduating Alameda High School senior, she had her pick of four universities to attend, San Francisco State University being one of them. O’Donnell attended the University’s Sneak Preview Day with her father and got to know the lay of the land, meeting other potential Gators, students, faculty and a surprisingly adorable addition to campus that day. O’Donnell accepted her admission offer to San Francisco State that same day, and she hasn’t looked back since. She now works as a student ambassador providing campus tours to help potential incoming freshmen make the decision that she made — rightly, she says — three years ago. “Coming to SF State has been one of the best decisions of my life,” she said. More than 16,000 potential students and their family members are expected to attend SF State’s 2019 Sneak Preview Saturday, April 6. The annual event welcomes first-time freshmen, admitted transfer students, high school students looking ahead toward college, and families and friends. 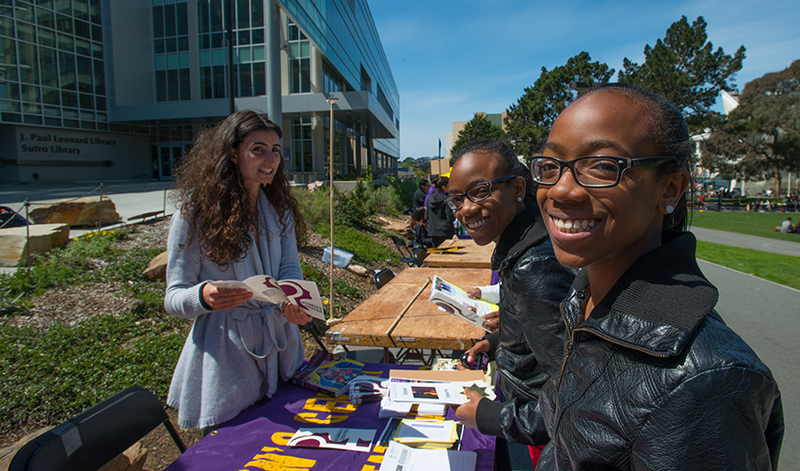 The all-day open house is a chance to experience SF State's unique offerings, from a vibrant student life to residential and dining options. Representatives from academic departments and student organizations will also showcase what they have to offer, and guests will be able to tour the Mashouf Wellness Center and check out its many services and features throughout the day. Prospective students and their families may also attend workshops on financial aid, take campus tours and learn about the more than 70 majors offered at the University. SF State’s Associate Vice President for Enrollment Management Maria Martinez says students can follow tracks catering to their specific interests and needs. This year, accepted students ready to join the ranks of the purple and gold don’t have to wait until April to officially accept their admission offer. Prospective students can also make up their minds at Sneak Preview by accepting admission and registering for summer orientation in the University’s J. Paul Leonard Library. Junior James Perocho is one of the SF State students who will lead Sneak Preview tours around the entire campus. He says prospective students are currently shopping around the country for a university that is a good fit, and events like Sneak Preview allow them to get to know SF State and make that decision for themselves. Sneak Preview will be held from 8:30 a.m. to 3 p.m. on Saturday, April 6, rain or shine. The event is free, but completing an online RSVP form is recommended. For directions to campus, hotel options and additional details, visit future.sfsu.edu/sneak-preview-open-house.